Trying to compare the best kick scooters for adults can be very tricky even though they are all fun to ride, so welcome to our useful adult kick scooter choosers guide. 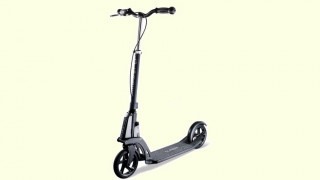 The guide can help you select the best adult kick scooter for your particular requirements. The comparison table can help you decide which model to go for as all the important scooter features are included. So why buy an adult kick-scooter? Because riding them is great fun? It's great way to travel self-powered down the street? Because you can ride on the sidewalk, a cycle lane or on the street if the traffic is light? Because you want a green and fossil-fuel free mode of transport? Deck length - is it long enough for your feet? Handlebar height - are you tall and need extra height? Brakes - does it have front, rear or hand-operated brakes? Polyurethane 13.0 lbs ABEC 7 200 mm 27.0" Yes, front and rear Yes Yes 2 years 2 years excluding wear parts (wheels, bearings, brake, grip, and handles). The Go-ped Know ped is a legend among those who know adult kick scooters. Produced in the USA it is the best quality kick scooter on the market bar none. It's hefty price tag is worth the exponentially greater quality that you get with this scooter. The extra wide deck, thick and wide solid rubber tires and super smooth ride are well worth the money. Of course, it also folds like any well-behaved adult kick scooter and it can be carried easily with one hand. The 6.5 inch diameter tires are much larger than what is found on many kick scooters, and offer an extremely low rolling resistance for efficient scooting. A front hand brake and a rear friction brake make stopping safe and simple. The large wooden deck has ample standing room for gliding and coasting. Patented heavy duty, light weight, 4130 Chromoly aircraft quality steel frame and single sided fork. Aircraft grade 6061-T6 hardened aluminum handlebar. The company started way back in 1985 and it's first production model scooter is proudly owned by the Smithsonian Institute. The manufacturing is done by hand at their Nevada plant and they also make a range of gas powered and other personal transport types. The spring system in the handlebar stem makes it very easy to fold and un-fold the scooter for instant tansport or storage. If it's an adult kick that you need, you simply cannot buy a better quality adult scooter. From the French scooter giant, Globber I'm including the Globber as it's a good locally shipped version of the Oxelo Town 9 and therefore cheaper. This may be the best quality adult kick scooter on the list for the money. It's certainly the most popular item on this list and great value. Again, like the Oxelo, you will not be disappointed with the quality of the Globber Adult One. The French seem to know a thing or two about kick scooters and this model is no exception. The folding mechanism allows for storage in even the tightest of spaces. The Globber doesn't have any suspension but they have made up for this by having a super comfortable, ergonomic handle bar and hand-grips that absorb shocks from the sidewalk. The folding mechanism of the Globber is also very sophisticated and it locks into place while standing upright folded which is a nice feature. The adult One is available in Silver or Titanium Dark Gray and looks very stylish, again probably due to it's French origins. The French like to look good whatever they do and kick-scoot commuting is no exception! This scooter can also be pulled behind you in trolley mode like the Oxelo which makes carrying it unnecessary. The 19 inch wide handlebar and stem height makes it suitable for adults over 6 feet tall. the folding system has a neat foot kick so you don't even need to use 2 hands when folding it. Just kick the folding button and it's done for you. The Xootr Mg is the latest Xootr kick scooter in their range of high-tech adult scooters. It's the second best-selling adult kick on this site next to the Globber Adult One. The deck of the Mg is solid magnesium (no kidding) providing the lightest deck structure and lowest deck height of any Xootr scooter to date. Xootr claim that the Xootr Mg is the most advanced kick scooter ever made, and it is their best selling model. The good news is that ist comes in a variety of colors this year. Blue, Green, Black and Red give everyone the choice to show-off these great-looking American scooters. The company is based in Old Forge, PA and their customer care center is also US based. The Xootr designs are really unique in the kick-scooter world which is probably why they have taken off so well. The deck is available in three colors: black, blue, or red. It also offers a wide deck which provides comfortable cruising, allowing you to have both feet side by side on the deck. the handlebar brake operats the rear wheel brake and works well even in slightly wet conditions. Micro Kickboard are known for their quality and back this up with a 2 year Warranty. Their reputation was set with the child-oriented kick scooters and this has translated well into the adult world. 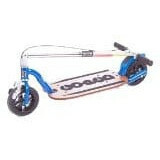 In fact, Micro Kickboard started with adult scooters some years ago but it was their kid models that made them famous. So, as they are no stranger to adult kick scooting, it's perhaps no surprise that they have produced the excellent Micro suspension scooter. It is the superb quality front suspension spring and rear suspension shock absorber make the Micro Suspension a very smooth and quality ride. 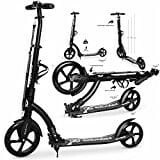 The kickstand is a useful addition and the warranty is second to none The Micro suspension has a long wheelbase which helps with stability for tall adults. You can use it every day for years as a reliable commuter scooter and the quality will not let you down. The Micro Suspension is currently the 3rd best seller on this site next to the Globber and Xootr Mg.
the rear fender brake works very well and is efficient because you apply as much pressure as you need with your heel to brake. The rear spring suspension can be adjusted to your individual weight for a custom smooth ride. the al aluminum construction makes the Micro Suspension one of our best buy picks for all-suspension scooters. You will be pleased with the quality of the Micro Kickboard and it will not let you down. The fetching bronze color helps this model look great too! If you already like the look of the Micro Flex scooters with their flexible kickboard for absorbing bumps and shocks, then take it to the next level with the Micro Flex Air. The air tires add a whole new level of comfort to the ride on this model. As well as absorbing more road noise and shocks, you can even go off-road with these chunky tires. Although it's not designed for it this is half-way to an all-out dirt scooter. These models are the BMX of scooters and designed for trail and dirt track riding. However, if you just need an ultra-comfortable commuting ride then this will do a great job. The air tires will need a little more maintenance than a regular scooter as the pressure will need to be maintained just like a bicycle. If the pressure is down the tires will wear more quickly so it's worth checking them regularly. Make sure that you have a small hand-pump available and even carry a mini pump in your backpack for emergencies. Also useful would be a puncture repair kit as urban environments are often littered with broken glass. If you need a high-quality no-frills adult kick scooter with a solid aluminum deck, then this is the best one for you. The deck is quite narrow like a traditional kick scooter but the larger 200mm wheels make it better for commuting rather than stunts. The micro folds up pretty small and can be locked to a fence or railing with the special lock which is included as an option on the alternate model. This is the special integrated interlock system which is included with the Micro White and Black scooters. It is a unique feature and a little hard to describe as it pull out a steel cable from the handlebar and uses a neat combination lock system so there is no key to lose. The Micro scooter has a couple of buttons to press to fold it up either side of the clamp at the base of the handlebar stem. It's an easy system to fold and make is very convenient when carrying on a bus or train. There is no maintenance at all to be done on this scooter as there are no suspension springs or brake leers to worry about. 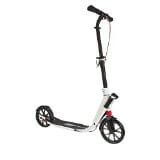 It's a solid, very well built and basic adult kick scooter available in White or Black. A great upgrade to a basic Razor Scooter. You get the superb Micro Kickboard 2 year warranty and there is even the option of swapping out the solid tires for air tires. Need to upgrade your Razor? Then this is for you. 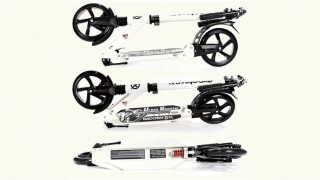 The Exooter M1850 6XL is a best-seller adult kick scooter with a difference. It's the unique wheel configuration with large 240mm at the front and 180mm at the rear that sets it apart. The larger diameter front wheel provides more stability and raises the handlebar off the ground more for taller riders. It does include an integrated carry strap which you don;t need to take off when riding. The attached down-tube on the handlebar stem is extremely rigid and the weld makes it much more of solid joint than the regular kick scooters that use the folding joint as the fulcrum of the handlebar. This Exooter is really great value for money because it has all the fancy features you could want like front suspension along with a hand brake and rear fender brake. The ABEC 9 bearings give a super smooth ride and it even has a drinks bottle holder. What more could you want in a budget adult kick scooter? The quick fold spring system is solid and works well. 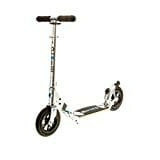 Exooter have made a great product at a great price and the M1850 6XL a super smooth ride on bumpy sidewalks. If you want all the features on a budget then this is the right scooter for you. The excellent and lightweight Fuzion Cityglide B200 may be the best bang for your buck for an adult kick scooter. It has gained a great reputation over the years for being one of the best budget adult kick scooters around. I would consider this to be an upgrade on the Razor A5 lux as it is very similar. The price is a little more than the Razor A5 Lux but you also get a better warrantly than with the Razor. It is almost identical in dimensions to the Razor A5 but it also has the nifty dual rear fender and handlebar brake. This means you have 2 ways to operate the rear brake. Great value for money in a commuter scooter. Our best buy budget adult kick scooter without a doubt. Our best buy budget suspension kick scooter. The Exooter M1350 8XL features front and rear shock absorbing springs along with a rear fender brake. the colors are fetching, especially the bronze aluminum which I personally prefer to the white or gray alternatives. It is a best seller on Amazon because it has a great warranty and quality build. Exooter have produced a perfect budget commuter scooter with the M1350 8XL. The Vokul V205 Adult kick scooter is another nice upgrade to the Razor A5 Lux. 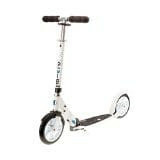 It is well built with an adjustable handlebar that is good for people up to 6 feet tall. The deck standing length is fairly short as it's designed to use with just one foot on the deck. If your feet are over size 10 then you might find it too short. I like the deck because it has a curve up at the front which acts as a splash guard against mud and dust from the road. This means that you don't really need the front mudguard, so they have left it off htis model. The folding mechanism is a 3 second German patented folding system which snaps into place to keep the scooter stem in place while moving. The Vokul is designed to be quite small when folded. It has an integrated carry strap at the front and you can sligh it over your shoulder when you're done. At 8.8lbs this is one of the lighter kick scooters in our list and is great for carrying longer distances or hanging on your shoulder for a long commuter train ride. They do have a 6 month warranty so you're covered for a while if anything goes wrong. 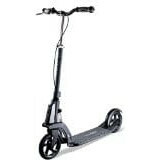 The Oxelo Town 9 is a top quality adult kick scooter made by the renowned French company that specialize in scooters. the unique folding system allows a super quick fold and release and you can pull the scooter like a trolley when it's locked folded. This model is a bit expensive because it is imported from France and all the extra costs associated with that are added onto the price. As far as we know it is the only model that has a range of accessories including a child platform which bolts onto the deck so that a small child can stand up in front if you while scooting. The construction and materials of the Town 9 are superb and the build quality is excellent. The braking system works well, the front handlebar lever actually operates the rear wheel brake. The Oxelo Town 9 has dual suspension. The front suspension unit is made of regular springs in the handlebar stem and the rear axle contains a shock-absorbing grommet rather than a spring but it works very well to absorb bumps in the road. Although you can definitely buy this model cheaper in Europe, I would says that it's still worth the money as an import, which is why the Town 9 is number 2 in our list. You will not be disappointed with the impressive quality of the Town 9. It is so superior to a regular Razor scooter that you really have to try it to understand how much better it is. Top quality French engineering gets a 5 star rating from Toyrider. 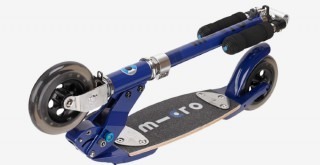 Micro Kick Board have done it again, not content with pioneering high quality kids scooters they also have a range of adult scooters of which this Micro Flex Blue 200mm is one of the best. As far as adult kick scooters go, the Micro Flex is a great quality product and one that anyone would be proud to own. In keeping with the rest of the Micro-kickboard range, the Micro Flex is well-engineered and feels like a quality kick scooter when you are riding it. The larger 200mm wheels make it a perfect adult commuter scooter and the flexible kickboard is an innovative way of providing suspension to smooth out a bumpy ride. 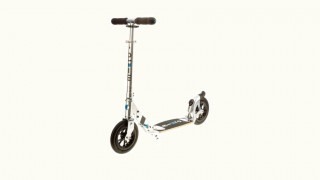 The Razor A5 Kick scooter is one of the best value kick scooters in its class for ages 4 up to 40. This solid, well designed piece of kit has been a best seller for a long time and, as time goes by it get's discounted further and further. You can literally grab one for a bargain price right now - under $60 in most cases. Here is a summary if you don't have time to read the full review. In the first of several Razor Kick Scooter reviews, we take you on a tour of the Lux A5 model which is perfect for children or adults. In fact I use it to commute to work! 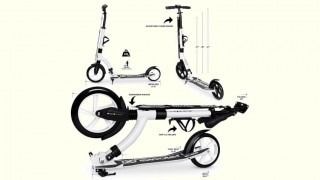 However, I would class it as an adult kick scooter because as you will read in this review it's great for commuting with it's 200mm large-sized wheels and durable tires. While the Razor A5 Lux does not sit at the luxury end of the market it is still a solid buy for those who want to try out an adult kick scooter without spending too much money. You can always pass it onto a friend or your kids when you upgrade to a more substantial scooter. Here is an overview of the best of Adult Kick Scooter Brands. The list ranges from specialist European Brands like Globber, and (IMO) the Rolls Royce Brands, Oxelo to top USA Brands like Xootr and Go-Ped. 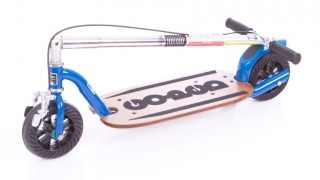 Also included are the famous Micro Kickboard scooters, who's quality products have to be included and last but not least, the trusty Razor USA Brand. Most of these Brands also make kids scooters as well as adult versions discussed in this article. There are some really top quality and high-end Brands out there like Xootr who make several high-quality adult models. For a full review of all the different types see our Xootr adult kick scooter comparison. The Xootr is pretty much the top-of-the line when it comes to adult commuter kick scooters and they are well worth the money. As well as Xootr, there are Brands like Go-Ped who make the most expensive and top-end kick scooter. That machine is built to last and Go-Ped offer a lifetime warranty to show how much confidence they have in their product. The Go-Ped is high-priced but it is the most durable on the market. In fact it may well be over-engineered for most commuting purposes as it is built like a tank. Oxelo are a French company that also distribute in the USA and their Oxelo Town 9 EF is a high-end adult kick scooter with all the features you might ever need. It really is the Rolls Royce of commuting scooters. Oxelo have some real enthusiast riders who swear by their products. We have had a bunch of people asking about the great looking adult scooter in the picture at the top of this article, it is the Oxelo Town 9 adult folding scooter and you can find it here: Buy The Oxelo Town 9 Adult Folding Scooter. Globber are a also French company that offer one of the best and most highly rated adult kick scooters out there, the Globber Adult One (price above). Again it's a top-end machine that will not let you down. The Globber Adult One (also known as the Kleefer Scooter) has a lot of unique features that other brands have not copied. Because these features are likely expensive to manufacture they remain Globber specific. For example, you can lock the whels and store the scooter in an upright position which saves space. Another nice touch is that Globber have eliminated carrying their scooters because they have a special 'trolley' mode. 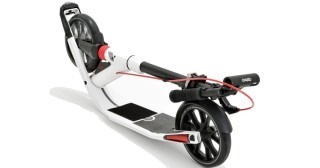 This means that you can fold the scooter then drag it behind you on it's wheel while holding the handle. Similar ot pulling wheeled luggage, this trolley mode is a really useful feature. Micro-Kickboard are another Brand that offer top-quality adult scooters via their Micro-Scooter range. This company is famous for it's Micro Scooters for Kids, however the array of options can be confusing so we created a page called Which Micro Scooter Is Right For Your Child? which can help you pick the right one for your kids. What is less well-known is that Micro Kickboard make an excellent range of Adult Kick Scooters as well. They make both double-front wheel versions and regular 2 inline wheel versions like the Micro Flex Blue for adults. A couple of these models are in our comparison table above but there is a few of notable Micro scooters that did not make the top ten like the Micro Monster Bullet Kick Scooter for adults. 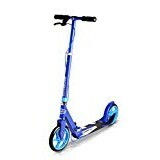 The super-popular Micro Monster Scooter is also a good buy, there is a two-wheeled and three-wheeled version. It has super wide wheels for stable cruising and the fat tires provide extra grip on wet and uneven surfaces. The 2-wheeled Monster Micro Monster is totally appropriate for adults is fold-able. It has a nice fat-tire rear and brake that is foot-operated by standing on the rear fender. The Micro Monster Bullet has a 4.4 out of 5 customer rating on Amazon so you know that people love it. You can buy it here: Buy the Micro Monster Bullet kick scooter. Another Micro Scooter model worth special mention, although it's already in the list is the fairly new Micro Suspension Scooter. Micro have really impressed people with this new addition to their family and I may consider including it in the top 10 table once I have given it a ride. However, it looks like typically high-grade Micro Kickboard manufacturing and I really trust the quality of their products. The Micro Suspension scooter is the first of the Micro Scooters to have suspension included and reports are that this works extremely well and gives a totally smooth ride. This is due, in part to the fact that Micro have mounted shock-absorbing springs on both the front and the back. Both ends of the deck are sitting on suspension coils and should absorb all of the road vibration so you won;t feel a thing as you're cruising to the office. It has the effect of eliminating the discomfort that can be caused by 'vibrating hands' as you hold onto the handlebar. This is a common complaint with Razor scooters without front suspension. One coil is underneath at the rear of the deck and the other is at the base of the stem over the front wheel. This patented shock absorber system elevates the Micro Suspension Scooter to top-class status and to me, it looks like a totally upgraded Razor A5 Lux. The rear fender brake is also present as with many adult kick scooters. It has the 200mm wheels and folding mechanism similar to the Razor A5 Lux but the suspension element makes this a superior ride. In fact, because the Razor scooters are so cheap but very popular it's not a bad idea for other manufacturers to create similar but much-upgraded models like this one. They have simply taken a popular product and improved it greatly, what could go wrong? Finally, there is the trusty Razor Brand. Razor has been making scooters for many years and are the go-to Brand for many Americans. They can manufacture in such large quantities that they can really bring the price down. One of the models that I like very much, but it didn't quite make the top ten list above is the Razor Cruiser Scooter. 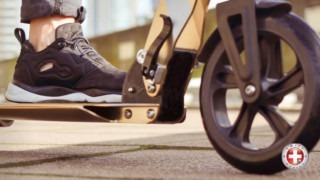 The Razor Cruiser has used a technique similar to the Micro Flex scooters in that the deck is made of plywood and bonded with a slight upward curve that gives it a slight suspension spring. The Razor Cruiser has nice, large 140mm wheels for street cruising rather than stunts and a rear fender brake which is now quite a common feature on many brands. The wheels are not the 200mm diameter that you will find on the Micro Scooters but they will do the job. ABEC-5 rated bearings will give the scooter a smooth ride and low axle resistance. You can fold the Razor Cruiser and it's good to carry at only 8lbs in weight. It's pretty cheap, so anyone can afford to buy the Razor Cruiser Scooter here. Aside, from these runners-up, you can find all of the best models in the Top 10 comparison table above. Each Brand and model has their own distinctive features to consider, but there are some fundamental things you should keep in mind when choosing an adult kick scooter which we will look into now. However you ride a kick scooter (personally, I like to chase my own son around the park on his own scooter). It's a great way to keep fit or to spend some quality family time. So here is our guide to comparing the best of Adult kick scooters, if you are not already an owner - then you are missing out! 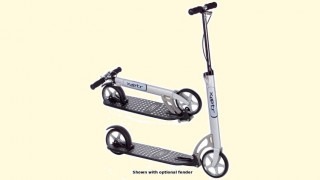 The adult scooter's features as opposed to a kids scooter are the grown-up design aspects regarding the body size, the weight and dimensions of the scooter kickboard, handlebars and wheels. 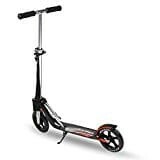 However, they are not always easily distinguishable from a child's scooter and as an adult buyer you will need to know what to look for in the best of adult kick scooters as they do vary in quality, weight and price. You will definitely have extra weight as compared to a kid so for that, you will need to pay attention the wheels of the scooter that you are planning to buy. The sturdiness of a wheel is rated with numbers in A's. This means that the higher the number, the tougher the tire. 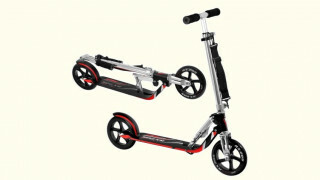 For instance, a scooter with 75A has softer wheels than 100A rating wheels that cruise comfortably on the road, but 75A wheels will wear out faster. A good choice for wheel rating is a scooter with an 85A wheel, which is a balance of soft and durable and will hold your extra weight without wearing out too easily. For the diameter, it is recommended to choose one that has a diameter of about 200mm, this will be faster and more comfortable than a very narrow wheel. Bear in mind that with the small size of scooter wheels, road friction does not play a huge part as it might with car tires so there is not too much variation in road friction. This is where kids stunt scooters come into play, because their tiny narrow wheels are great for fast stunts. Not likely to be your concern as an adult rider! The height of the handlebar post will determine if you have to lean forwards as you are cruising on the kick scooter, which will most likely be uncomfortable. The standard and recommended height of the handlebar should be between 42 to 43 inches. This is additional to the 4 inches or so of the kick board height. At around 36 inches, the height will comfortably reach the waist of most adults up to 6 feet tall, a perfect fit as you cruise on your scooter. Your arms should be reasonably perpendicular to your body without needing to lean on the handlebars. They are mainly there for grip and balance rather than leaning on like a bike handlebars. Having suspension on the back and front wheels will help to absorb road shocks in an effective way. As you consider the suspension, keep in mind that it will affect the response of the scooter as you are kicking or pushing, soft suspension will take more effort. Ensure that the scooter has the right suspension for the sake of being able to support your weight well and if it's too soft then kicking the scoot along will be difficult. 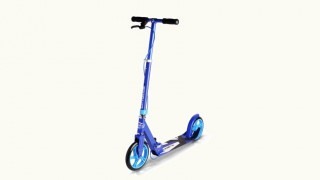 You will also need to consider how stable the scooter will be, especially when you are at a higher speed. The stability will be in relation to the wheelbase, which plays a huge role in supporting the overall weight when you are on the scooter. The larger the wheelbase, the more stable it will be (up to a point, of course). The best recommended size of wheelbase for an adult kick scooter is between 25.5 and 28.5 inches. To be clear, the wheelbase is the distance between the front wheel and the rear wheel, and the longer the better. Clearly the adult scooter should have a longer wheelbase than it's kids counterpart - so be sure to compare the two before you buy. You will also need to consider the deck and the frame, in particular the material used. The most recommended type is an aluminum deck, which is tough and also light although there are some good flexible plywood decks out there. A light weight is important as this means that you can easily carry it around whenever you need to go up stairs on an escalator, carrying the scooter easily will be important to you. The adult deck should also be a fair bit wider than a child's scooter to support both feet when traveling at speed. Most kids scooters have tiny decks for their tiny feet. Make sure that your ultimate choice has a reasonably wide deck or it will be too uncomfortable to ride in your size 10's! The deck on the Xootr Kick Scooter is particularly wide and great for big feet. As well as the major features listed here, you will need to know how much the scooter weighs. This is the clearest differentiator between an adult and kids scooter as the adult's version will be heavier - even if only slightly, as the strength of the pins and couplings also count for a lot. As mentioned, the overall weight is important as you will want to fold and carry the kick scooter especially if you will use it for commuting. High strength and more weight are usually associated with heavy-duty adult scooters, it is worth taking this into account. You will want something solid but the price will usually go up as the scooter gets lighter because it's more expensive to manufacture an adult kick scooter with super-lightweight components. Anyone who has compared mountain bikes or similar will have found the same. For an adult scooter, the most suitable weight is between 10 to 12 pounds. This will be heavy enough to match your weight and light enough to carry around. It is important that the kick scooter should have a hand-brake as well as a good rear brake for extra safety. Be aware that you will need a longer stopping or braking distance than a child. Normally an adult will have more kick power than a child which makes them faster on the scooter and as safety is paramount, stopping quickly will save you from serious mishaps. So it's worth paying attention to brakes when comparing and adult kick scooter! We would recommend that it's essential to look for one that has a hand-brake as well as a foot heel brake for the rear wheel. Most of the kid scooters have no hand-brakes at all and even some of the best adult scooters only have a single rear foot brake which might be fine for you. The rear brake should be a heavier brake designed for adults that can withstand a lot of pressure, but it's worth taking note of and looking at reviews before buying. If you possibly can, find one with both a front a rear brake according to your budget. The scooter should also have a kickstand, which gives you much more flexibility when parking it. Mostly as an adult, you would be visiting busier locations and you wouldn’t want to leave your scooter down on the ground where it might get damaged. This could be a minor issue, as most will have one but you will need a scooter from a manufacturer that offers great service if anything untoward should happen. 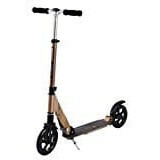 When you are cruising around on your kick scooter you will most likely come across some scrapes (it's normal as there is some risk involved with riding these things) so you may need to have the scooter serviced or repaired regularly. At least it's worth knowing that if a disaster should happen that you will not be left high and dry and forced to replace the kick scooter with a new one. Compared to a kids scooter which is mostly ridden around the neighborhood or at home, you could be riding your kick scooter in busy streets much further from home. An adult scooter is more of a serious mode of transport - you may use it for commuting and so you and the scooter are best served if it has a good service warranty. 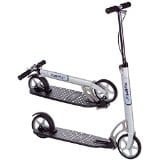 Also, if you want the best adult kick scooter, you will consider what purpose they are especially made for. Commuting, sports, stunts or leisure? Scooters do come in all shapes and sizes. Each one will likely be made with a specific purpose in mind and the manufacturer should explain this clearly. 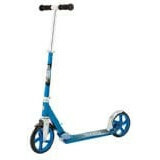 Some adult kick scooters will last for a very long time even in rough conditions, while others that are designed for best performance may be lighter and less durable. so again, choose your scooter according to your reasons for using it. Is it primarily for getting to work? Folding and carrying on the train or bus? Is it for pure leisure around the city? Will it be put in the trunk of your car a lot? Will you use it for stunts? For our money the Razor A5 Lux and The Micro Flex Blue are some of the best value adult scooters for different reasons. You can read all about the excellent and reasonably priced Razor A5 Lux on our review page. We included it because it's one of the best value adult kick scooters on the market. 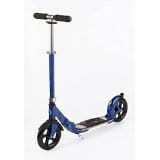 However, if you are after something more of a top-end but still medium priced adult kick scooter then head on over to our Micro Flex Blue Best Adult Kick Scooter Review. The Micro Flex by Micro Kick Board is a great quality adult scooter that has some interesting features. 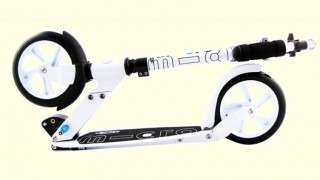 Micro Kickboard are really well-known for their kids scooters, especially the ones with the double-wheels at the front, but these adult models are not so well-known. 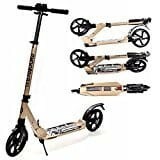 Thank you for reading this guide about how to compare the best adult kick scooters and please feel free to leave comments about your own adult scooter experiences below. These bikes are intended for children who are just getting to the age where they could start riding a tricycle or even if they have already been riding a tricycle and are getting close to ready for a two-wheel bike. Thanks for the kind comments Kscoot! Can you please tell the name of the scooter on the picture ! The scooter in the picture looks like oxelo town 9. Thanks 'Stranger' - Hi Elizabeth, I have posted a link to the Oxelo scooter in the article above! Any recommendation as far as manufacturer or brand/model rugged enough for an adult 6'2" at around 300lbs? Hi Stephen, thanks for the comment and rating. For a tall adult and a strong scooter I would recommend the Xootr Ultra-Cruz which has an extendable handlebar and a 300llb weight capacity. You can grab one by clicking the image of the Ultra Cruz In the comparison table above. Cheers!